We had an amazing 256,000 students registered last year! Find your school on our map. Click here to read about how best to develop problem solving with your pupils. PRoblem-solving for Irish Second level Mathematicians (PRISM) contest is the brainchild of NUI Galway mathematicians Dr. James Cruickshank and Dr. Rachel Quinlan, and aims to encourage students to take an interest in problem-solving from an early age. Each participating school will hold separate hour-long contests for pre-Junior Certificate and post-Junior Certificate students and equivalent in Northern Ireland. One aim of the contest is to identify interested and talented students who might enjoy and benefit from participating in a mathematical enrichment programme at NUI Galway, NUI Maynooth, UCC, UCD or UL. We want to get schools doing simultaneous equations simultaneously...! Click here to register your school now for Simultaneous Simultaneous Equations. You can also play the digital version of the Pig dice game. Find places of mathematical interest in your area and help build our Maths Map. Schools and classes around Ireland are encouraged to submit pictures of their brainteaser work and upload their answers on Twitter using the hashtags @PDSTNumeracy @ScoilnetPrimary. All entries will be submitted to a draw to win a set of PDST Numeracy Manuals. 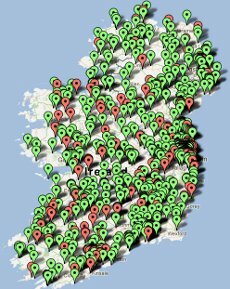 Have you seen our interactive map where you can locate Irish mathematicians by their home county? It can be very positive to share stories of mathematicians present and past to help see mathematics as a human activity. You can also identify a local maths feature and get it on the map - it could be the place a famous mathematician was born, lived or worked; a natural or man-made feature that has an interesting maths aspect or a organisation or company that is using mathematics. Click on the map on the left to get started. A maze is great fun and it can be a maths learning experience too. Why not draw some of these mazes on your school yard and watch children problem solve!